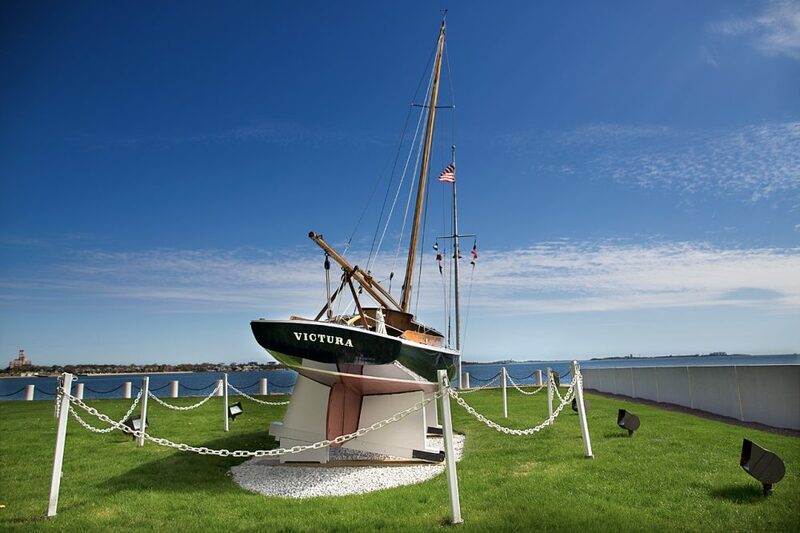 Ever since the opening of the John F. Kennedy Presidential Library and Museum in 1979, the Kennedy family sailboat Victura returns each May, remaining on display through the summer and fall. The crew from Crosby Yacht Yard in Osterville, where the boat is stored each winter, erects the 25-foot wooden sloop on a stretch of grass facing the Boston Harbor, careful to set the boat on a tilt, as if it were sailing into the wind. In his new book, "Victura: The Kennedys, A Sailboat, And The Sea," author James Graham dives into the Kennedy family's relationship with sailing, and the role this handcrafted sailboat plays in their legacy. "You know, I look at [the Victura] and I see brothers and sisters and cousins having fun together, learning to sail together, passing that heritage down from one to the next, and I just see a family," Graham told WBUR. One aspect of the story I tell is the fostering and development of the Kennedy brand and it really started as early as the mid-1930s, when Joe Kennedy was just emerging as a political figure and invited news media to come and photograph his children on sailboats. Even the 1934 Boston Globe had a photo of Jack and Bobby on the bow of the Victura. And of course, that famous photo in 1953 on the cover of LIFE magazine with a young Sen. Jack Kennedy and his fiance, Jacqueline. That boat is so inextricably tied to the family image. There are numerous little doodles that he drew of sailboats and sailboats that look just like the Victura. Even the evening before he died in Texas he left a doodle of a sailboat in his hotel room. That image, it's a touching aspect of the life of John F. Kennedy that even in these trying times, like the Cuban missile crisis, you'd see doodles of a sailboat as though he were trying to mentally transport himself away from the trouble of the day, back to the joys of sailing and the sea. Coming in second was never good enough. And there is kind of a constant theme throughout their lives, stories of coming from behind. And that really, I think, was a life lesson for them. They learned from sailing that you could be several lengths behind in a race and still catch up and win a race. Certainly in politics, that's a valuable lesson to learn early. He loved sailing it from his own childhood. There's a story of his older brother Joe Junior sailing with him when Ted was very young. Joe was frustrated with Teddy's lack of knowledge of sailing and picked him up and threw him in the water. And then Joe Junior jumped in after him and retrieved him. But despite that early experience, he loved the sport. After John and Robert Kennedy died, Ted certainly must have felt that sailing the Victura and other boats was a great way to reconnect with his nephews and nieces who were then fatherless. I think Ted, too, particularly after his brother Robert was assassinated, easy to imagine how shocking that moment must have been, and to just collect his thoughts he would go off and sail at night by himself. And I think that even when you're the president or you're a senator, like Ted Kennedy was, and tragic incidences occur, that going out to sea helps put it all back into perspective.